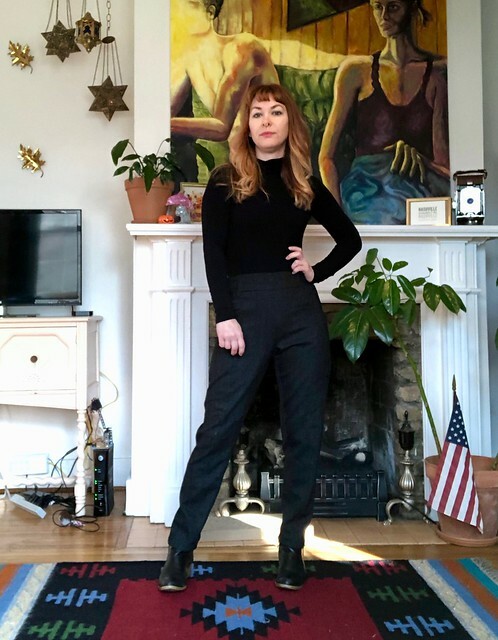 I’m usually a jeans girl when it comes to my winter wardrobe – but this month, I wanted to jump a little out of my style zone and try something different. Back when I used to work in an office, I wore a lot of wool suiting. I love everything about wool – but my absolute favorite part is how WARM it is. I am always cold, winter is my enemy, and wool is my BFF. 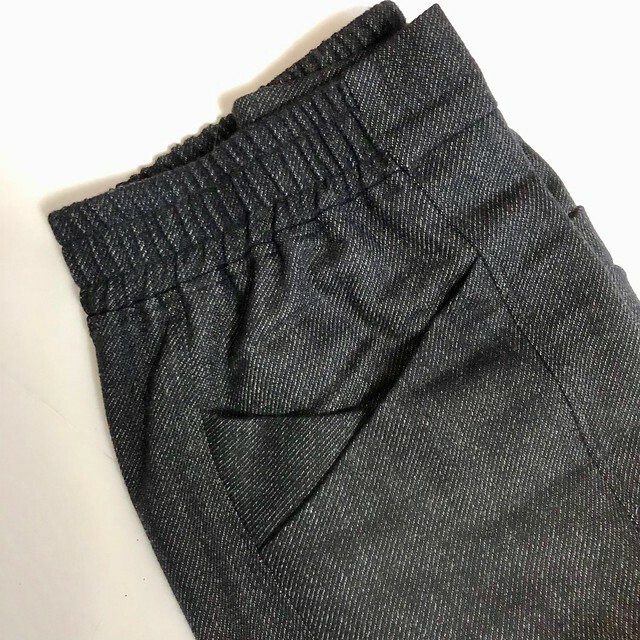 I haven’t owned a nice pair of wool pants in many years, though, so I decided to make a new pair to get me through this season! I went to NYC last month to visit family for Christmas, and was able to pop into the Mood Fabrics store on the one day I had in Manhattan. I went straight upstairs to the wool section so I could pick out my fabric in person. Mood Fabrics has lots of great wool suitings available online, but I was looking for something specifically light and drapey that had a bit of texture without looking too much like it should have been worn by Don Draper. This beautiful suiting caught my eye and I did not hesitate to get a couple of yards cut to take home. The suiting is lightweight and soft, with a subtle twill weave in black and grey that gives it lots of dimension. AND its not itchy. What else do you need in life? As nice as this fabric was to buy (and – also important – easy to carry around for the rest of day, as it is also lightweight! ), it was even nicer to sew! It gave me no issues with cutting or sewing, and had minimal shedding. I used an 80/12 universal needle to seam all the pieces together, then serged them with my overlocker. 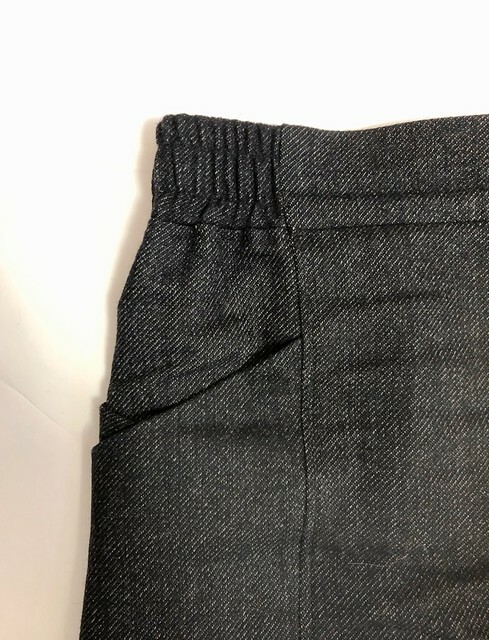 I did have a little bit of trouble getting the seams to press flat after sewing – I imagine there may be a little bit of poly in this fabric, as wool usually responds really well to pressing – but by using high heat and holding it down with a clapper until the seams cooled made a huge difference. I also topstitched several of my major seams, which isn’t very noticeable with this fabric but does help keep everything nice and flat. The pattern is the Palisade Pants from Papercut Patterns – one I’ve been wanting to try since it was released last year! 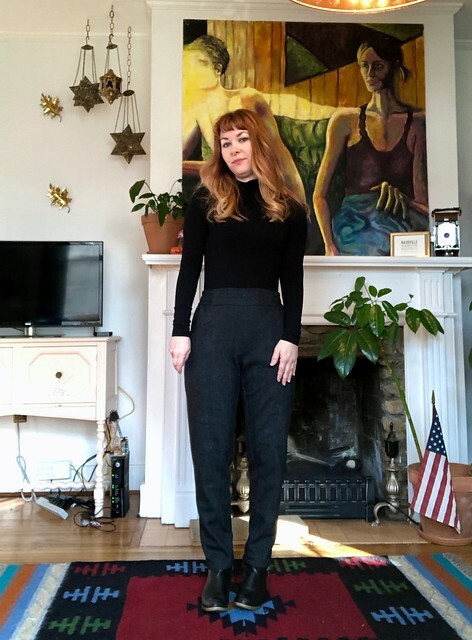 I love the classic shape with those interesting pockets, This style is very similar to the Elizabeth Suzann Clyde Pants, but I think a little more refined. The pocket detail is more geometric, and the elastic doesn’t go all the way around the waist of the pants. I love the ES originals but I’m so happy to have a pattern where I can knock a pair off for myself! 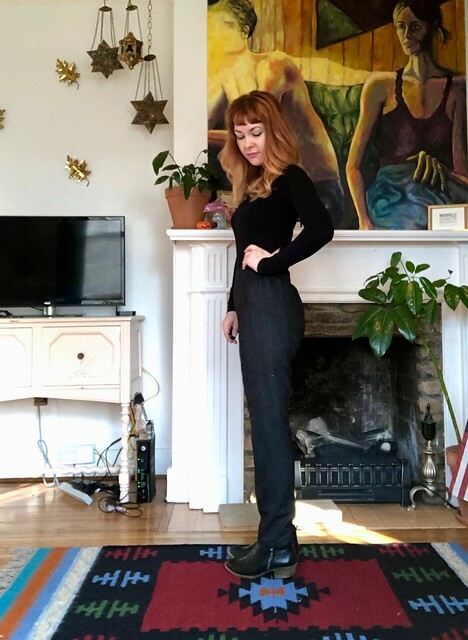 I sewed a size XS and took about 1.5″ out of the crotch depth, as well as redrawing the crotch curve to be more scooped (these are both common adjustments I make on most pants patterns). I also took an extra 1/4″ out of the inseam for a slightly slimmer leg. Construction-wise, I omitted some of the interfacing on the pockets (basically anywhere that had 2 layers of interfacing, I just used one layer) to keep the fabric nice and soft but still give it some structure (if you’re curious, I pretty much exclusively use fusible weft interfacing – including on this garment!) and only interfaced half of the front waistband (again, so it was only interfaced on one layer instead of both). I left off the mock fly so the front would be sleek and uninterrupted, and I added topstitching to the front + back legs, as well as center front and center back (to better mimic the Clyde pants, as well as help with keeping the seams flat). FINALLY, I added a couple extra lines of stitching to the elastic waist, to keep the elastic from twisting. I really like how these pants turned out! The style is very comfortable (woohoo for loose-fitting legs and elastic waists!) but the shape is still very sleek and the wool suiting makes them look really high-end. And they are WARM, which is exactly what I was trying to achieve! In these photos, I’m wearing them with my Niko/Nettie merino wool bodysuit from last month’s post.